Commemorate baby's extraordinary arrival with Suzanne Pollack's celestial keepsake design. Our milky way is home to 100 billion planets and 250 billion stars, but your baby is the only one in this entire universe. Commemorate their arrival with Suzanne Pollack's celestial keepsake plate. 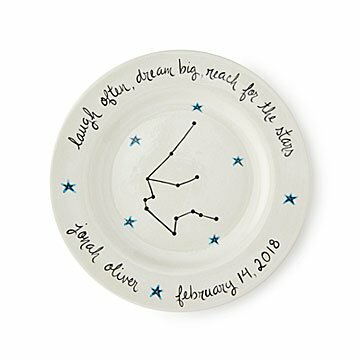 Hand-painted with charming details inspired by the cosmos, it's personalized with their name, birthday, astrological coordinates, and a sweet phrase: "Laugh often, dream big, reach for the stars." Though they may be too young to use it now, the design makes an elegant display until they're ready for snack time in the "stars". Ceramics imported from Italy. Hand-painted in Massachusetts. As a child, Suzanne Pollack learned to paint by watching her grandmother’s colorful brush strokes and mimicking them on her own canvas. Today, her New England studio is decorated with those original paintings, and she looks to them each day for inspiration. Though she’s moved away from painting pictures, Suzanne still keeps a family theme in her custom pottery. She loves to paint the details of a customer’s life into her works, making them personal, sentimental keepsakes to pass down through generations. When she’s not inventing new designs, Suzanne loves to cook and take long hikes with her dog Bruce. Hand wash strongly recommended. Microwave and dishwasher safe.